These pages give some ideas of the topics I have worked on during the last years. They include links to further reading and some of my publications (partly in German). The way information and data are represented and processed by (traditional von-Neumann) computers is very different from the way humans remember and processes knowledge. In some cases computers are therefore helpful tools for humans. But in many other cases these differences lead to problems in the use of computers. A better understanding of the way humans remember and process knowledge can help to adapt computer programs to the needs of their human users (and is of course an exciting area of research in its own). Studying new models of computing can - on the other side - support the understanding of some features of human information processing. Many of the projects I have been involved in during the last decade have been linked to these questions in one way or the other. 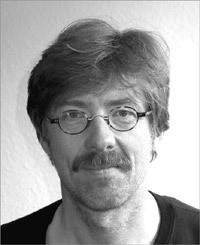 Professor at the Darmstadt University of Applied Sciences, department "Media" (Information Science). PhD student at the department of Mathematics of the University of Marburg. Dissertation on cellular automata.